With the beginning of spring, roadsides across Palestine are filled with khobeizeh; and it’s very common to see people stopping their cars by the side of the road, and get out to gather enough khobeizeh for a lunch or two. 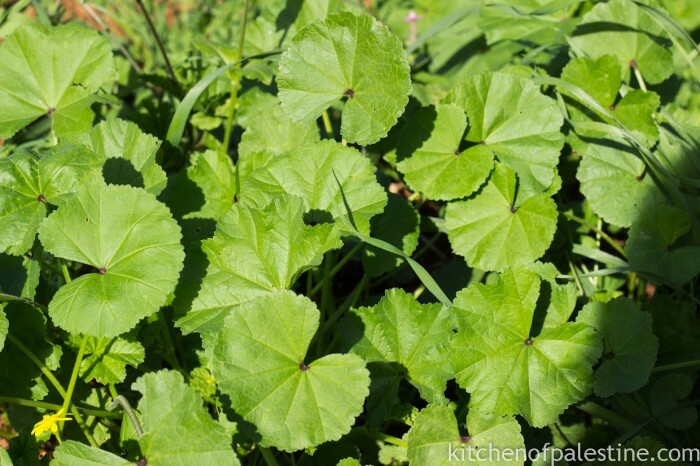 Khobeizeh is an edible wild green plant known as mallow or malva that grows in different climates all over the globe. It’s been used in cooking and medical use since old times. It’s packed with nutrients and has many health benefits; it’s believed to calm and sooth stomach and digestive system in general, also, it’s been used to reduce inflamed conditions, and to heal damaged skin, wounds and burns. 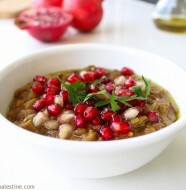 When I asked my mother for her khobeizeh recipe, she laughed and told me there is no recipe! 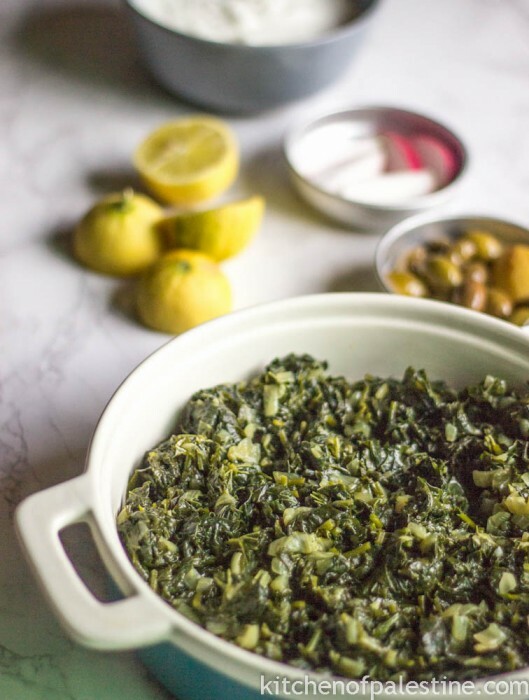 just cook it with olive oil and onions; and this is the only way I know to cook and eat, not only khobeizeh, but many other wild green plants. However, I’ve found some recipes online that use it uncooked as an ingredient in salads. In such case, I think that leaves should be small and tender. I don’t know where the name “khobeizeh” came from, but it is somehow similar to the Arabic word “khobiz” which means bread. 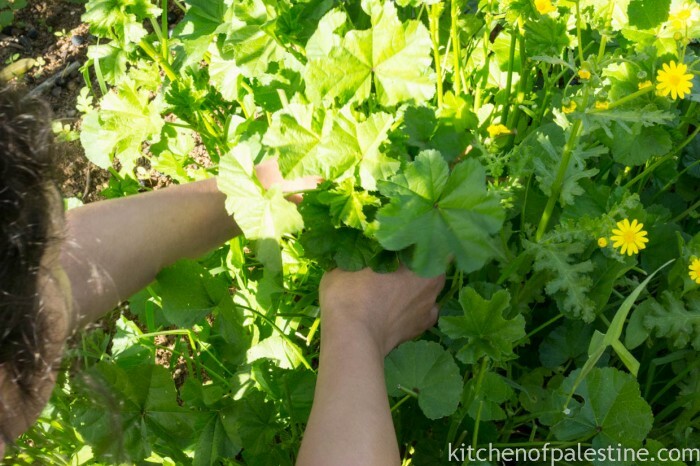 Cut the stems off (I keep the tender part of the stems), chop the leaves into 1 cm in width, and then place them in a bowl filled of water. Rinse thoroughly twice or more until the water runs clear. Bring olive oil to medium heat in a frying pan, saute onion for 3 to 5 minutes until softened and slightly golden. Add khobeizeh (mallow) and garlic, and salt. Cover and bring them to a simmer over a low heat for a bout 15 minutes or until it's cooked. Pour in a small serving plate, add lemon juice and red chili pepper. Serve warm with bread, fresh yogurt and green olives on the side. 6 Comments on "Mallow Cooked With Olive Oil (Khobeizeh)"
I love Khobeizeh, but I do not know whay its become rare in Morocco. It is called Khubeizah, since indeed the name comes from Khubez, which is Bread. The fruit of this plant resembles a loaf of bread…. Packed with Iron it is a great (and FREE!) substitute for spinach. 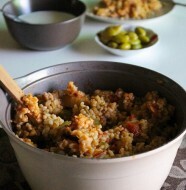 Can be used for a Vegie Version for your wonderful Shishbarak recipe. 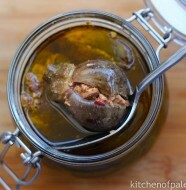 Forgetting for a moment there is no such place as paelestine, this recipe comes from Jerusalem. It was especially popular during the cruel Arab siege of Jerusalem with another failed attempt to part Jews from their eternal capital. When the Jews were starving this mallow grew in the cracks of the paving stones and became a valuable food source until the city was liberated and returned to safe Jewish hands. Great recipe. There,s no room for crude Iraeli nationalism here. 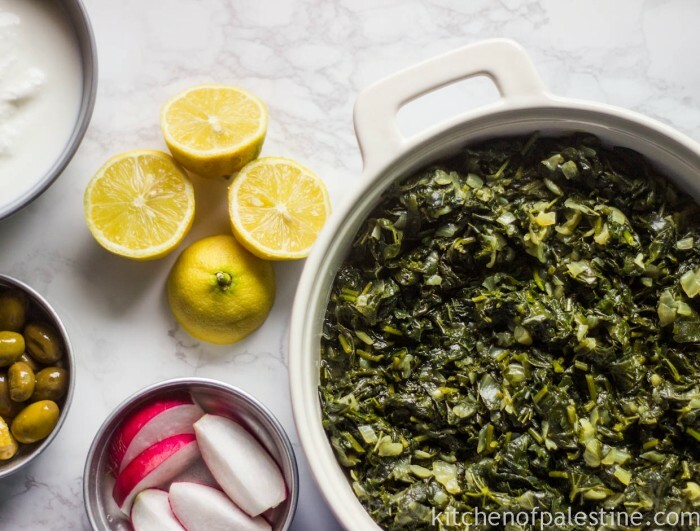 Such recipes are the product of the historic land of Palestine and the many kinds of people who have lived off the land and town markets.